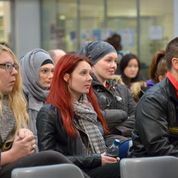 The NUS Day of Action event on the 29th January 2015 at the University of Bolton brought together representatives from youth services, the Students’ Union, academics, and students with a desire to debate current youth issues. The conference opened with NUS Vice President Piers Telemacque raising awareness of the desperate position of the Youth Service since recent austerity measures. Reflecting upon his own personal experiences of youth work, Piers encouraged youth and community students at the event to lobby for a political system that values the opinion of young people and invests in a Statutory Youth Service that tackles ‘youth issues’. Whilst he did not speak about youth work funding and existence of provision, it was clear that the promotion of the NUS Early Day Motion (EDM) for a Statutory Youth Service was the agenda for the day. 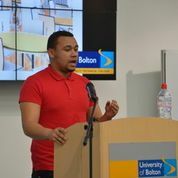 All in all Piers succeeded in creating an atmosphere favourable to debate and conversation on the challenges to youth services posed by continuing austerity cuts. Paula Connaughton, Youth and Community Work lecturer at the University of Bolton, spoke about the dilemmas facing youth and community work programmes because of the changing nature of youth services. On the one hand she drew attention to the increasing difficulty of finding ‘suitably’ qualified supervisors for placement students, on the other to the emergence and potential for social enterprises that were now providing youth services. She discussed the demise of open access clubs, a common feature across local areas a few years ago, which have endured the worst of changes under the commissioning and outsourcing of youth provision. As her talk focused on the disproportionate cuts made to youth work, she highlighted the current situation that councils do not have to statutorily provide youth services. In terms of ‘youth issues’, she argued, this hindered the potential for young people to take up opportunities for personal, social and educational development. No doubt, councils have to make difficult choices, but as Paula stated, cuts are having a huge impact on the youth sector in terms of stability and young people are losing out! Representatives from a number of local youth services spoke about the ‘youth issues’ affecting young people in Bolton from rising homelessness, because of changes to Housing Benefits, through to youth unemployment. Whilst some representatives spoke about how the survival of their organisation depended upon working harder and longer hours, others were more specific about adapting to change with the recruitment of volunteers, and the need to take on more targeted work. 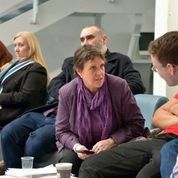 Julie Hilling MP provided a more critical account of the existence of youth work, as she warned of further cuts to youth services. 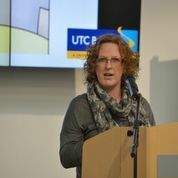 Those attending the event were treated to Julie’s forecast that impact of cuts would not only end open-access provision based on non-formal education, but would result in the extinction of youth services per se, unless youth and community workers and practitioners became active in supporting the NUS EDM and voted with their feet. Taking to the stage a final time, Piers shared his sense of the values at the heart of campaigning as well as ways of organising. It was disappointing that nobody spoke about the potential for political education with young people, but, as stated, the event was staged around the NUS campaign for a Statutory Youth Service, though details of what this actually means in practice were not explored. Thanks to Paula Connaughton for the report and photos.